It's always worth having a few clever laundry hacks up your metaphorical sleeve for those days when your wash doesn't turn out like it should. We've polled the Real Homes office for everyone's most-hated laundry problems, then researched the best laundry hacks to deal with them. So read on, and get a brighter, shrink-free result every time. Want to know how to do laundry like a pro? Use our essential guide and never get any laundry load wrong again. Why? This has probably happened because you've either been using too little detergent in a hard water area or you've put too much washing into the machine with heavily soiled items. Hack? Rewashing with the correct detergent dose in the hottest water safe for the fabrics should brighten most items – and you should do this every third wash to preserve whiteness. But, if that doesn't do the trick, the solution is vinegar. Really. Simply pour half a cup of distilled white vinegar into the drum, followed by your load, and wash as normal. It's great for softening towels (see more on that below) and there's no need to rewash – the vinegary smell will disperse in the rinse cycle. Why? If you live in a hard water area, the minerals in the water can make your towels hard and scratchy – a long way from the hotel-style fluffiness you enjoyed when you first bought them. Hack? You can, of course, try the vinegar in tip 1, especially if you are restoring coloured towels. White towels can be put through the hottest cycle possible with a cup of ammonia. Tumble drying will restore fluffiness, especially if you throw in a balled up sheet of tin foil – but don't dry towels on radiators as this will also harden them. Why? Dark colours – perhaps dark bedlinen – and denim jeans sometimes come out of the wash with white streaks on them, even when you're using detergent for colours. This is because friction in the wash can remove dye along creases. Hack? There's not much you can do with existing white streaks other than re-dyeing your items. However, you can prevent it in future by turning items inside out and selecting a gentler wash cycle in future. Why? White streaks of powder left on fabrics after washing are usually due to the machine being overloaded. Hack? Rewash, reducing the load. Why? Some deodorants, mixed with perspiration, cause staining. Hack? Buy new deodorant... and soak your items overnight in hot water containing a cup of bleach. Rinse and wash as care label advises. Our advice? Check the care label first, just in case it advises against bleach; and don't just soak the stains, immerse the entire item. Not working or nervous of using bleach? You can sponge the sweat stains with white vinegar or with a mixture of lemon juice and baking powder, then pre-treat them with an enzyme pre-wash stain remover. Then wash on the hottest cycle safe for the fabric. Add that cupful of bleach for especially stubborn marks. Why? If you've shrunk your woollens – whether a favourite sweater or beautiful bed throw – it's probably because the wash cycle temperature was too high or the drum action too vigorous. Hack? It goes without saying that in future you should only wash woollens on the wool cycle. But is the damage reversible? Not always but... your best option is to rewash the items (if they've dried already) and, when still damp, carefully stretch them back into shape before drying them flat. Find out more about how to handwash clothes (and delicates) in our guide. Hack? You can't reverse this damage (other than with a needle and thread), but swap to a gentle detergent for next time. Why? You went running, they're muddy. Or just not just as white as they were. Hack? First things first, we'd recommend checking care labels to see if washing is discouraged or not. Then we'd recommend putting the trainers in a mesh bag for protection, detaching and including the laces. Lastly, put them on a cold wash if they're coloured trainers to stop them fading. A hot wash might shrink even the sturdiest of trainers, so keep to a cool(ish) wash whatever happens. If you don't like the banging of the trainers on the dryer drum, lacing them back up and shutting the laces in the door will keep them from being flung about. Why? Your cupboard itself might be a little damp or it might be that slightly damp washing in an airless space means nothing is drying properly. Hack? Drilling neat holes in the door of the cupboard will allow air to enter, as will leaving it cracked open. Obviously only putting washing away when it's completely dry will help, but putting an open box of baking powder in the cupboard will help keep it fresh. You'll need to replace it every now and then. Bags of dried herbs will help, too. See the next tip, too, for quickly freshening already musty items. Why? You've hung something freshly ironed in your wardrobe or put bedding in the drawer but it's gotten creased in the meantime and now you need it to look good fast. Hack? If you don't have a tumble dryer, the only option is to iron. Sorry. If you do, though, pop the item in it with a dryer sheet and an ice cube for 10 minutes; it'll come out smelling fresh and wrinkle-free. Find the best model for your home at the best price in our buyer's guide. Why? If you've overloaded your tumble dryer, it's likely the washing is taking ages to dry. But if you've got little time to get those jeans/spare bedding dry and need to speed things up, there is a handy laundry hack to try. Hack? Throw a towel into the tumble dryer with your stubbornly wet washing. It will help absorb the moisture and your washing will dry faster. Why? Who doesn't want to ditch ironing? We're all for laundry hacks that mean we can do less ironing (or the same amount faster). Hacks? Try all of these, altogether: make sure to use fabric conditioner in the final rinse; only spin at lower speeds; reshape your clothes while they're still damp; select cooler and shorter tumble drying cycles; hang shirts, skirts, dresses and jackets on hangers to dry, then fold them carefully when thoroughly dry. This will help you avoid ironing in most cases. Still got a few items that need tackling? Iron them while they're still damp – it's quicker and easier. Choose a new iron from our pick of the best models on the market. Need a new ironing board? Find the best one for your home here. Why? Sometimes if you iron an item on a setting that's too hot, you'll melt the material on to the bottom of the iron. Then, the next thing you iron gets the residue transferred on to it. Hack? For starters, it's important to iron at the temperature advised on the care label... but how to remove the burnt-on residue? The best, and quickest, way is to heat the iron to the warm setting, then to rub it with a tightly stretched, damp cotton cloth or towel. If that fails, try rubbing the bottom of the iron (when cool) with white toothpaste or bicarbonate of soda, applied with a coarse, damp cloth. Why? If your washing rarely looks as bright or smells as fresh as it should, it's likely that your washing machine itself needs cleaning. Hack? Washing machines work hard but are brilliant at harbouring bacteria (see our feature on getting rid of germs for more on that), so giving it a clean will ensure your wash load comes out sparkling and that your washing machine lasts as long as it should. Use our guide to find out how to clean a washing machine in six easy steps (hint: vinegar is involved). Washing machine had it? 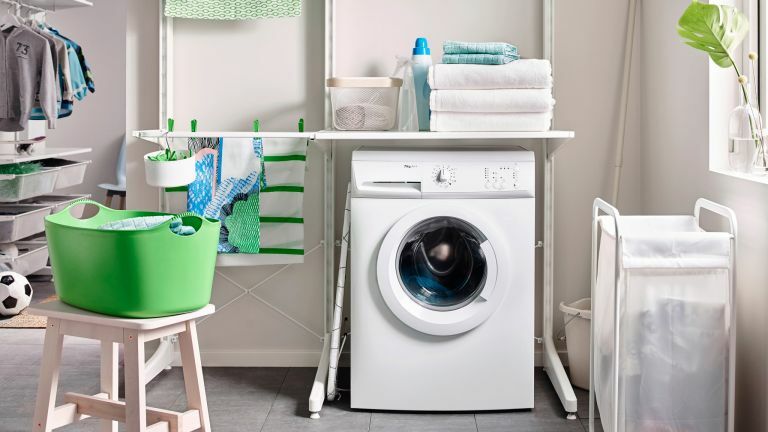 Find the best washing machine for your laundry needs in our buyer's guide.